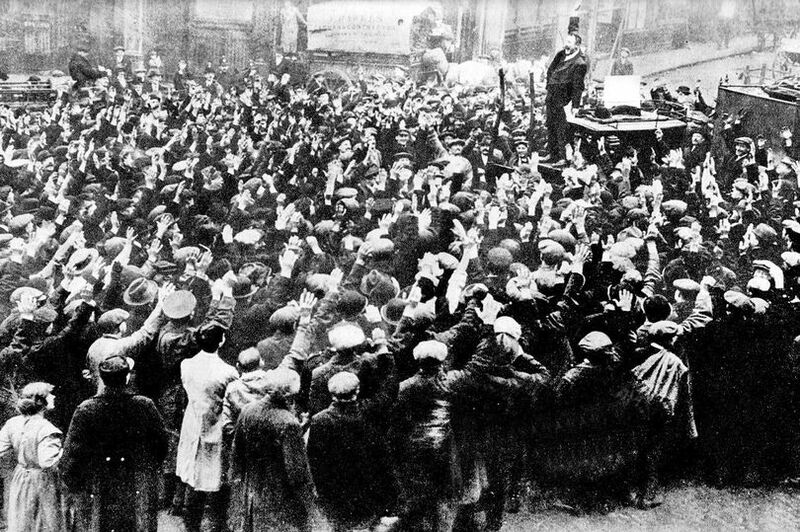 World War One split the anarchist movement, with a minority supporting the Allies against the Central Powers of Austria and Germany, a smaller minority supporting the German state, and a majority holding on to an internationalist position. Kropotkin, Charles Malato , Jean Grave and their supporters were ranged against Malatesta, Domela Nieuwenhuis, Luigi Fabbri, Emma Goldman and Rudolf Rocker. In the Yorkshire town of Huddersfield this split in the movement could be seen in the clash between the pro-war George Greensmith and the internationalist H.B. Flanders. Huddersfield was a town with a syndicalist tradition, thanks to the activities of E. J.B. Allen who promoted industrial unionism and syndicalism. Allen formed the Industrial League in 1908 and promoted revolutionary unionism in Huddersfield to where he had moved. Fred Shaw, a Huddersfield engineer, was a member of the British Socialist Party and a supporter of syndicalism. Other promoters of syndicalism who visited Huddersield to promote syndicalism were Tom Mann and Guy Bowman. Honley Socialist club was a venue for many of these meetings. One of its members, who took part in and spoke at meetings at the Club was the anarchist George Henry Greensmith. He was born on the 16th August 1876 in Burnlee near Upperthong in Yorkshire. According to the 1901 census he was living in Outlane, a village near Huddersfield but soon moved to 4 Church Street, Paddock. He worked as a master baker and was a member of the Bakers and Confectioners’ Union. He was its representative on the local trades council, though in a rather inactive role, failing to be elected to its executive committee in 1915. He spoke at Honley Socialist Club on ‘How to Realise The Socialist Commonwealth” in 1908. Himself sympathetic to syndicalism, he chaired a number of open air meetings given by Allen at the Market Cross in 1909. In 1914 he chaired an anti-militarist meeting where Guy Bowman spoke. He himself claimed at the meeting that one of the first demonstrations of anti-militarism was locally at Rawfolds Mill where a soldier was flogged for refusing to fire on the Luddites. Also in that year he attended an anarchist conference in Newcastle in April, and spoke at a public meeting there alongside Will Lawther of Chopwell and Walter Ponder (then in Glasgow in the Anarchist Group there). Ten years younger than Greensmith, Horatio Burnet Flanders (Burnet often wrongly transcribed as Bernette, Bernard or Bertram!) was born in Islington in London in December 1886. He became an anarchist communist and supported Guy Aldred’s paper The Herald of Revolt (a letter by Frank V. Gledhill in Aldred’s The Word describes Flanders as “your (Aldred’s) old friend and contemporary”). He was arrested on Sunday night, July 23rd, at Marble Arch and charged at Marylebone the following day with wilfully obstructing the footway and selling pamphlets. Flanders, described as a labourer,(1) and another were displaying a large yellow placard bearing the inscription Herald of Revolt outside the gates of Hyde Park and selling pamphlets. “He refused to go away” and was arrested. Flanders denied that he had caused obstruction and said that it was customary for organisations that held meetings in the park to sell literature outside the gate, Flanders continued that for the sake of their cause they thought justified in going against a law which was class made, in order to spread ideas. “We do not fear punishment in order to batten some of this hypocrisy down”. Mr Paul Taylor presiding regretted that he could not justify prisoner by fining him and bound him over to keep the peace for six months. By the time of the war Flanders was in Huddersfield, living in Jim Lane, in Marsh. He worked as an agent for Britannia Assurance. He regularly spoke at meetings before and during the war. The war resulted in Greensmith reneging on his anti-militarist positions and adopting similar views to Kropotkin. He went as far as supporting the Huddersfield Workers Own Recruiting Committee (HWORC), which seems to have been set up with influence from the government by the pro-war John Hunter Watts, member of the British Socialist Party (later when the BSP was taken over by the anti-war tendency, he left to join the National Socialist Party in 1916 with H.M. Hyndman). In 1915 he was employed by the War Office as a recruiting agent and arrived in Huddersfield in June. He operated in Huddersfield against the not inconsiderable local anti-war sentiment which went beyond just BSP, ILP and anarchist militants. The HWORC prove to be a failure and was wound up with the introduction of conscription, with Hunter Watts leaving Huddersfield. Greensmith to his discredit supported the activities of the HWORC. The Huddersfield and County Forum Club was set up by John Brooke of the ILP shortly before the war, and acted as a place or debate among Huddersfield radicals. H.B.Flanders spoke there in June 1915 with an anti-war speech entitled ‘Nationalism’ and Internationalism’. Greensmith responded in August with a pro-war speech, ‘Anarchism and War’. The local socialist paper The Worker reported the meeting under the heading “A Pro War Anarchist” (2). In addition to this Greensmith tried to get a hearing for the HWORC at the Trades Council, but this was rejected (3).Greensmith and Hunter Watts wrote pro-war letters to The Worker(4) that appeared in the issue of September 18th. Greensmith subsequently dropped out of public life by the end of 1915. He died at the age of 56 on 20th December, 1932 at Middleton, Yorkshire. As to Flanders, he continued with anti-war agitation. In May 1916 during the course of a No Conscription meeting in May 1916 at St. George’s Squareand and after the speakers had left the platform Horatio Flanders and his son Joseph climbed up and the latter produced his call up papers. The Worker wrote “He said that for many years he had been a socialist and anti-militarist, and he was there to make a protest against the Military Service Act. He declared: “As a proof I openly and solemnly swear that I will not serve under any military law or do any military service likely to assist any military organization. As further proof I will publicly burn the papers the military authorities have given me.” The papers were then burned and Mr. H. B. Flanders called for three cheers: “For a man who has the courage of his convictions." The audience responded with the three cheers and then sang “The Red Flag.””. The local paper the Huddersfield Chronicle described this as a “disgraceful incident”. The police raided H.B. Flanders home in Marsh in 1916. Later on September 25th 1918 he was reported to have attended the annual general meeting of the local trades council where he raised the question as to military drill in local schools and that a discharged soldier was teaching boys to form fours. He was elected to the executive of the council at this meeting (Huddersfield Daily Examiner, Sept.26th, 1918). Flanders subsequently joined the Communist Party and ran as a Communist in the council elections in Longwood ward in 1920, receiving 461 votes. I have found no further reference to him after this, not even the date of his death. (1)	The 1911 Census gives his employment as ‘house painter’. (4)	According to Cyril Pearce, Greensmith organised the commemoration of the Paris Commune by Huddersfield anarchists at the Market Cross on March 18th 1915. According to a report in the anarchist paper Freedom written by G.H. “About a dozen stood round and sang the " Marseillaise," while a woman played a cornet;… all Socialists were invited but no one but Anarchists turned up to take an active part. The situation was a bit critical owing to a few war-mongers who tried to incite the crowd against us but were not successful”. Speeches went on for two hours. Afterwards one comrade was attacked by a “man twice as big as himself” when the others had left. If this was indeed Greensmith who was involved in this, the use of the term “war-mongers” seems uncharacteristic of him for that period. Parker, William Brand, c.1855- 193? A great snapshot of radical history, thanks for researching and writing!